Kimberley Expeditions offers outstanding cruises without the top-end price tag! Kimberley Expeditions offers a wide range of affordable Kimberley Boat Cruises, full of breathtaking sights and unforgettable experiences. We have been operating in the Kimberley region for over 18 years, and aim to offer a variety of Kimberley Boat Cruises and tour packages. Choose from our cruises below or give us a call! We offer a range of cruises, with seniors discounts available, all are tailored to offer an expedition with competitive prices as a standard. Explore the incredible sights of the Kimberley aboard our new vessel the Reef Prince. From the time we take your first inquiry to the time you step back onto land, the team at Kimberley Expeditions will strive ensure that you get the cruise of a lifetime into the magical Kimberley region. The crew of our vessels have been chosen carefully. From Marine and tourism backgrounds all our crew have been carefully trained and inducted by our Cruise co-ordinator and Nick – the owner. For instance, as well as being a qualified Chef with a RSA our crew may also have additional tickets like STW95, Coxswains certificates, Master 5, Engineer Certification and AMSA medicals. See photos from our cruises for some absolutely breathtaking sights, all waiting for you to experience – aboard a cruise with the team at Kimberley Expeditions. Check out the availability of our current cruises, and if you would like to fill out a quick form, click here and we will contact you with any information you require. We are also available by phone on Freecall 1300 874 707 if you would prefer to chat. 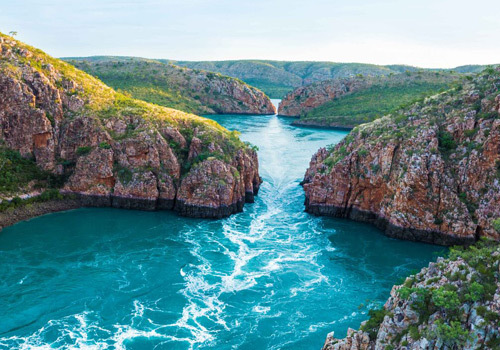 Western Australia’s Kimberley is one of the world’s last great wilderness areas, covering an expanse of nearly 13,000km of remote coastline. It is difficult to access and has fewer people per square kilometre than almost any other place on Earth. This is big tide country with one of the greatest tidal ranges in the world, with up to 12 metres of movement every 6 hours sculpturing the land. Almost every island on the Kimberley coast is surrounded by a fringing reef, rich in marine life. Hidden along the coastline are remnant rainforest pockets and towering cliffs. Aboard Reef Prince you will have the chance to explore this untouched part of the Kimberley and experience our new itinerary allowing you to enjoy the very best the Kimberley has to offer.